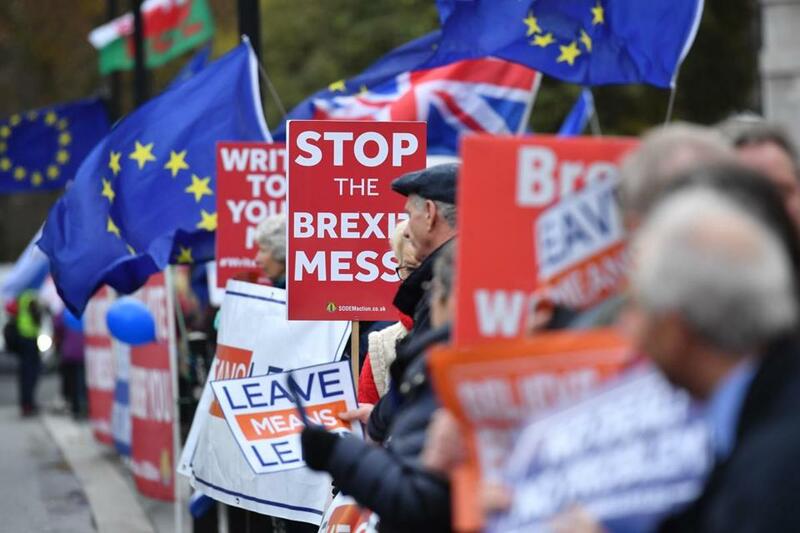 Demonstrators for and against Brexit protested opposite the Houses of Parliament in London on Wednesday, as British Prime Minister Theresa May returned to the House of Commons after a series of defeats by members of Parliament that threaten her government and could change the course of Brexit. LONDON — British lawmakers opened Round Two in their bruising battle with Prime Minister Theresa May’s government over her Brexit deal, as the release of previously secret legal advice provided more ammunition for opponents of her unpopular divorce agreement with the European Union. May’s Conservative government is struggling to convince skeptical legislators that the divorce deal it has struck with the EU is a good one ahead of a vote in Parliament on Tuesday that could sink the agreement and possibly cost May her job. May’s deal is in trouble because politicians on both sides of Britain’s EU membership debate oppose it. Pro-Brexit lawmakers say it keeps Britain bound too closely to the EU; pro-EU politicians say it erects barriers between Britain and its biggest trading partner and leaves many details of the future relationship undecided, subject to negotiations after Britain leaves the bloc on March 29. Opening the second of five days of debate, Home Secretary Sajid Javid told legislators Wednesday they should back the Brexit agreement to safeguard Britain’s vital security relationship with the EU. ‘‘No one can pretend that this deal is perfect in every sense,’’ Javid acknowledged. But he said the alternative was ‘‘an uncooperative no-deal’’ Brexit that would shut Britain out of EU security tools and EU data-sharing organizations. ‘‘It is my belief that the deal on the table is the best option available in ensuring a smooth exit from the European Union,’’ Javid said. ‘‘How could a serious member of Parliament vote for nothing more than a wish list?’’ he said. In a historic first, legislators on Tuesday found the government in contempt of Parliament for refusing to publish legal advice it received from the country’s top law officer about the Brexit agreement. The government had argued that such advice is customarily kept secret. But it bowed to defeat Wednesday and released the reasoning from Attorney General Geoffrey Cox. The main thrust of Cox’s advice was already known — the government released a 43-page document about it Monday in a bid to fend off the contempt motion. But the defeat demonstrated the fragility of May’s government, which does not have a majority in Parliament. The legal advice also provided fuel for May’s opponents, who dislike a ‘‘backstop’’ provision in the Brexit agreement that would keep Britain in a customs union with the EU to guarantee an open border between EU member Ireland and Britain’s Northern Ireland. The border backstop is strongly opposed by Northern Ireland’s Democratic Unionist Party, which props up May’s minority government. The Protestant, pro-British DUP says the deal weakens the bonds of the United Kingdom by treating Northern Ireland differently than the rest of the country. The DUP and pro-Brexit Conservatives want May to go back to the EU and try to renegotiate the backstop. Both May and the bloc insist the withdrawal agreement can’t be changed, and rejecting it means leaving without a Brexit deal. Pro-EU legislators say the amendment makes the prospect of a ‘‘no-deal’’ Brexit less likely, because Parliament can direct the government to take that option off the table. Brexit-supporting legislators worry that opponents of Brexit in Parliament may try to water down the terms of departure from the EU, or even reverse the country’s decision to leave. Fox said that would be ‘‘a democratic affront’’ to the 52 percent of British voters who opted in a 2016 referendum to leave the bloc.